I didn’t have the Chinese black vinegar specified by the recipe, but a quick bit of web searching told me that apple cider vinegar would be a good substitute. And apple goes well with pork, right? I left out the eggs as well – they’re really only there to round out the meal, they don’t contribute anything to the actual pork. The first thing that struck me was that there’s something mildly weird about eating a meal where you’re spitting out the occasional toenail. Other than that, it was delicious! I have to say though, that there’s bugger-all meat on trotters. It’s pretty much all bone, cartilage, fat and skin. It’s got a lot of flavour, but there’s not much you can actually chew on. No wonder they add the eggs to the recipe above. It was deliciously velvety gloopy, and the little bits of leftover sauce set into a solid jelly. There’s truth in the old saying, “something gelatinous is a foot”! For the rest of the trotters, I think I’ll try making some of Heston Blumenthal’s Trotter Gear to use as a flavour enhancer for other recipes. 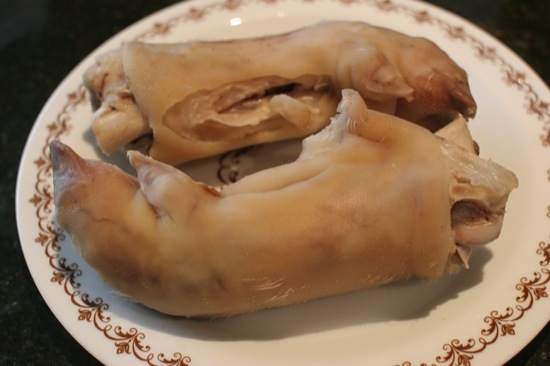 Now, does anyone have any ideas for two pigs heads? The cheeks have already been removed (I’m going to try guanciale with them). Yummmmm, It’s nice to see you appreciating the whole animal like that..I guess your our very own Illawarra Hugh F W…..I seriously am not sure my boys would go for spitting out toe-nails though..lol…. The recipes you are thinking of sound delicious. Many many years ago it was these Gelatinous joints that were boiled up to make gelatine..no shop bought gelatine back then. Darren, email me your address so I can send you on some garlic seed, you were one of the entries that won! @nellymary: Hehe, I had to wait for a night I was home alone to cook this! Not much interest from the rest of the family :-). 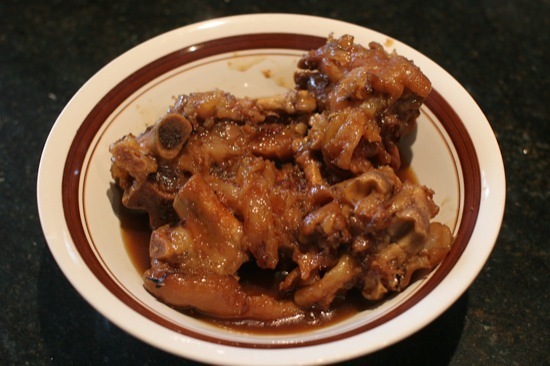 The “trotter gear” recipe turns into a nice pot of jelly, which can be added to stews, risottos, soups, etc for a flavour kick. I can’t wait to make it! I’ve emailed you about the garlic seed. Thank you for publishing this information on the internet. Decided to drop back in to say I did do the pork ears post in the end (: Thought you might be interested hehe, if you haven’t already used up your heads yet. @Shuhan: Thanks, I’m glad you did! I’m going to try one ear poached, similar to your recipe, and the other one fried crispy. @Mandy: Yeah, those Farmstead Meatsmiths have a bunch of great videos on Vimeo. They also have a series of eBooks coming out, which look like real crackers!